Looking for an easier way to manage your organization's costliest asset? As a business owner, you know that your workforce is the engine that drives your company’s growth, but it is also one of your most costly assets. According to PricewaterhouseCoopers, labor costs represent 28 percent of annual revenue for U.S. companies. In managing your workforce, you need a solution that will help you reduce labor costs, promote worker productivity, and hire the talent that will help grow your business in the future. Genesis Workforce Management Software can help your organization transform how you find, manage, grow, and retain your workforce. Our workforce management software, composed of time and attendance, human resources, and payroll, makes it possible for you to accurately manage all aspects of your workforce through one web-based application. From recruitment to offboarding, the suite uses intuitive employee and manager self-service (ESS and MSS) features that empower employees. A robust reporting engine lets managers customize reports, address employee issues directly, and dynamically view and export data in a variety of formats. By automating many of the manual, time-consuming processes associated with managing your workforce, our workforce management suite helps you improve operational processes and grow your business while you ease compliance and save time and money. Get in-the-moment access to your data. 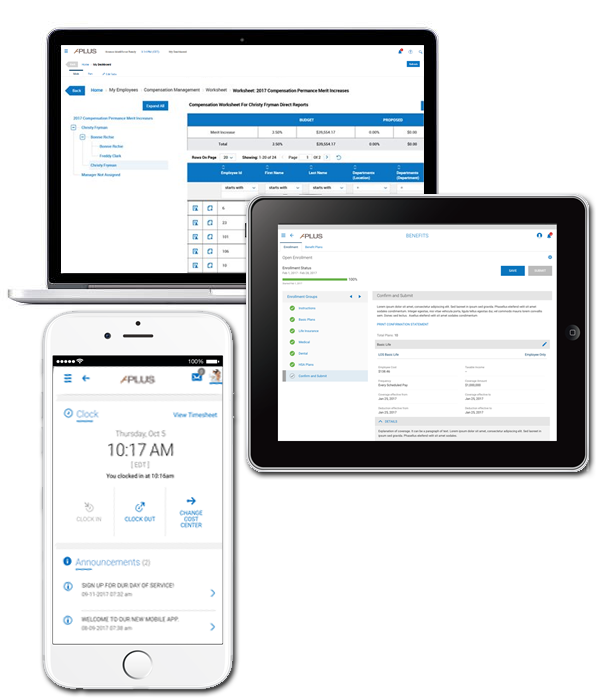 The suite effectively eliminates the guesswork of labor expenses by seamlessly integrating HR, Payroll, and Time and Attendance, allowing data to be viewed and analyzed in real time. This enables you to see the full picture of your operations whenever you need to. Seek out and retain the best talent with an application process that is easy for candidates to use and reduces the overall time it takes to fill open positions. Streamline the onboarding process by reducing manual entries and redundancies and automating communication. Give employees the power to access their schedules from anywhere so they can efficiently manage their own time. Give supervisors the tools to access real-time employee data for driving productivity, increasing employee engagement, and making more informed business decisions. Streamline payroll processes so paychecks, vendor payments, and tax filings are always correct and on time. Watch the video now to learn how insight into real-time labor data and actionable reporting improves your operational efficiency. As you elevate the way your employees work, you’ll create and foster an environment where employees thrive and are truly engaged. Whether you employ the entire suite of applications or deploy a single solution, we give you the tools to increase efficiency, reduce labor costs, and optimize processes.